SafeHip® AirX™ is a 100% textile hip protector with the protector shield based on AirX™ spacer fabric technology, which is a breathable, skin friendly and soft textile material. The AirX™ technology is your guarantee for optimal compliance. Model that fits both sexes. 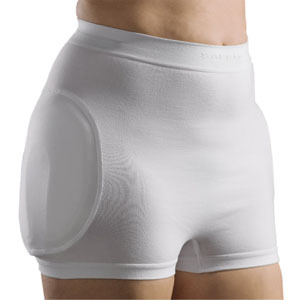 Can be used with sanitary pads for light incontinence. Can be worn over user's underwear. Complies with disinfection control requirements.